Mainly sunny to start, then a few afternoon clouds. High 74F. Winds NW at 10 to 15 mph..
Piper Jones,1, brother Mason, 4, and their mom, Autumn Jones, play near the mesh fence around the pool at Ron and Pat Jones' home. The fence enhances safety without being distracting. A mesh fence can add a level of security and help keep kids and pets away from pools and other dangers. A mesh fence is "a good-looking alternative to wrought iron," says Matt Baranowski of Pool Guard of Tucson. A mesh fence can be removed, rolled up and stored or moved to a new home. It is more difficult for children to climb than wrought iron. As adoring grandparents, Pat and Ron Jones were thrilled to take care of their baby grandson while the child's parents headed off on a vacation getaway. There was one problem: there was no security fence around their pool, which was built before barriers were required. "They were really nervous about the pool, and told us they would feel more comfortable if there was a fence,'' Pat Jones said of the parents of grandson Mason, now 4. While safety was their top concern, Pat worried a fence might obstruct the view of Pusch Ridge and shrink the open space. After doing research, she and her husband opted for a mesh pool fence over a more traditional wrought iron fence. It required fewer poles, fewer holes drilled in the flagstone and less interference with the views. The fence provides an added level of security for the watchful grandparents, especially now that granddaughter Piper, 1, has joined the family fun. The fence keeps their two dogs safe, as well. A secure barrier, along with constant adult supervision and education, are crucial elements in drowning prevention. Nothing can take the place of adult supervision. According to the Centers for Disease Control and Prevention, drowning is the leading cause of injury death among children ages 1 to 4, with most drownings occurring in swimming pools. The Joneses' mesh fence was installed by Pool Guard of Tucson, owned locally by Matt Baranowski and his wife, Carol. Matt Baranowski said some homeowners are opting for mesh over wrought iron for a number of reasons. The mesh fence is tension-based and can be installed on any surface, Baranowski said. Holes a little larger than an inch in diameter are drilled to install reinforced aluminum poles. Posts for the mesh fence are required every three feet, while wrought iron bars must be four inches apart, Baranowski said. The PVC-coated nylon mesh is durable and won't fade, peel or rust, Baranowski said. He said the cost of a mesh fence can be 15 to 20 percent less expensive than wrought iron, costing $1,350 to $1,500 to install. It provides a secondary barrier for homes that have automatic locks and alarms on doors and windows. While Pool Guard does not recommend taking down the fence, it can be removed, rolled up and stored in the garage if not needed. It can also be moved to a new home, and color-coordinated plugs are used to fill up holes in decking. Self-locking pool gates and pool alarms provide added security. Jeff O'Neill, owner of Affordable Fence & Gates, installs both mesh and wrought iron pool fences in Tucson. He said the mesh product has improved greatly over the past few years, and provides a good alternative to iron. O'Neill said his company installs more wrought iron than mesh, "but they both have their place." 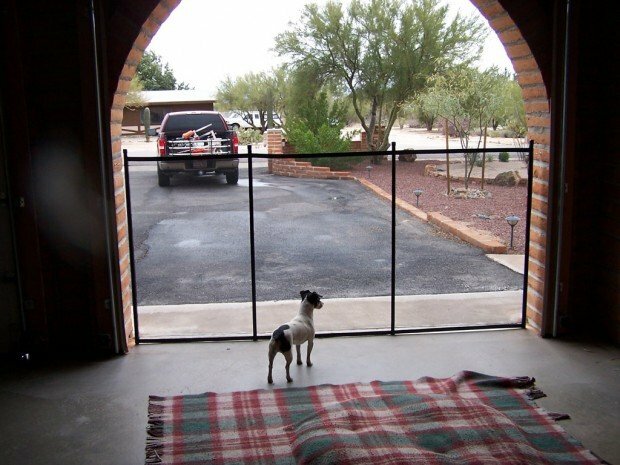 He installs Magna Latch for a self-closing gate on both wrought iron and mesh fences. "It's the best thing out there," O'Neill said. Some mesh fences are the same price as wrought iron, and an average, basic install of both wrought iron and mesh costs $1,200 to $2,800, depending on size, he said. Mesh requires less maintenance to keep it looking good, he added. Occasionally, pool owners want to remove a mesh fence after city or county inspection, which is very dangerous, O'Neill said. "If that is your barrier, it must say up." Christopher Bradford , owner of the local distributorship of Protect-A-Child Pool Fence Company, said a mesh fence is more difficult for children to climb than wrought iron. He said his customers seem to prefer the stronger fiberglass poles, which he offers in addition to aluminum at a higher cost. He said the average fence is $1,350 to $1,600, depending on materials used. It is safest, however, to leave it up year-round. The fence works well in large as well as "postage-stamp" yards in preserving space. "You can fence off the pool while maintaining a play area for the kids," Bradford said. The fence stands up well to harsh desert elements. "The sun may discolor some of the parts after a decade, but I see some fences still going strong after more than 15 years," he said. • Make sure your pool or spa has an effective barrier, such as a fence, regardless of whether they are covered. • Lock all doors and windows leading to the pool area. • Fence gates should have self-closing, self-latching mechanisms. Latches need to be out of reach of young children. • Never leave your child unattended in or near a pool, hot tub or spa -not even for a second. • Keep toys, tricycles and other children's play things away from the pool or spa. • Don't consider your children to be "drown-proof'' because they have taken swim lessons. • Don't allow barriers, such as fences or walls, to give you a false sense of security. There is no substitute for adult supervision. • Become certified in CPR. • Learn to swim and teach children to swim. • Yell for help and pull the child out of the water. • Begin CPR if you are trained. Adam Goldberg, captain and public information officer for Northwest Fire District, said consumers should do their homework when it comes to selecting a pool security fence. Goldberg said mesh fences that are as tall as their 5-foot wrought iron counterparts appear to be as effective - as long as they are kept are in place. He recommends checking the name of the product with safety organizations, as well as ensuring that the company you contract with is licensed, bonded and insured. Ask for references, Goldberg said.